The Dow Jones Industrial Average did not return 13.54% in 2016, although that is probably a number that you’ll see quoted. Adjusted for dividend reinvestment, the 2016 Dow Jones Industrial Average Return was actually 16.47%. That’s a full 2.93% points higher due to reinvested dividends. As we wrote in our last article on the 2016 S&P 500 Return, only using the index price return is unrealistic. When limiting the scope in that way, it’s as if dividend payments aren’t received or destroyed. Even if an investor chooses not to reinvest dividends, price returns can be very far from the real gain. We have a Dow Jones reinvestment calculator on the site which has a monthly resolution. It will do the math for you on how an investment would have performed with dividends reinvested. 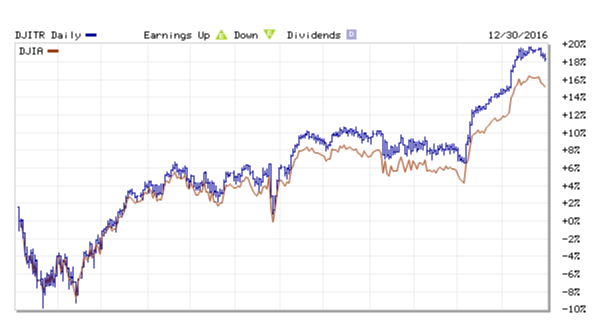 2016 Dow Jones Industrial Average Return and Dividend Reinvested Return. *If you instead count from the close last year, the returns are 16.50% and 13.42%, respectively. We prefer the ‘contained in the year’ methodology on the site, but know there is more than one way to calculate this. As always, I hope this was enlightening. You’ve got to count those dividends. What are your Dow – price and dividend reinvested – return predictions for 2017? Does your brokerage let you reinvest dividends for cheap… or free?